Hi There! 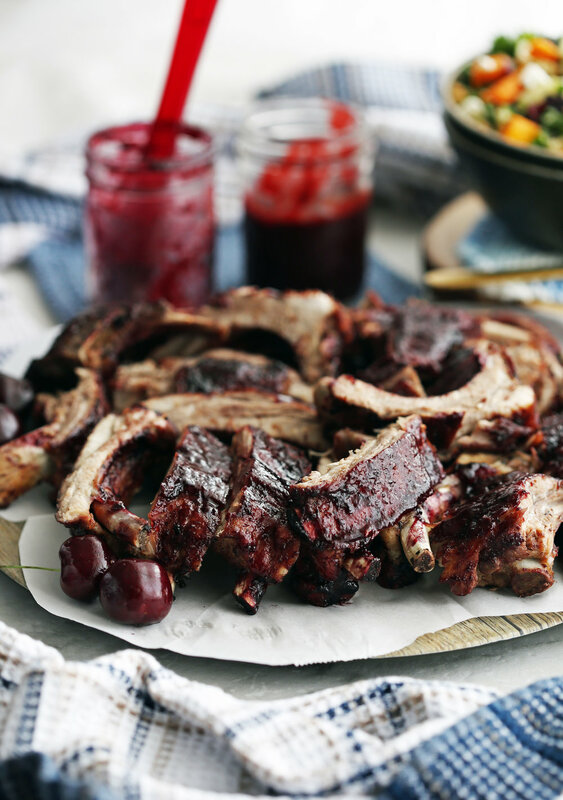 Today's new post is another delicious Instant Pot recipe: Baby Back Ribs with Cherry Chipotle Sauce! Plus, take a look at my other Instant Pot recipes when you get a chance, including soups, stews, pasta, and chicken recipes by clicking right here. What’s in this pork baby back ribs recipe? Baby Back Ribs (aka pork back ribs or loin ribs) are the main star of this dish as you can probably tell from the name of this recipe. On average each pork rib rack has 10 to 13 ribs and can weigh anywhere between 1½ - 2½ pounds depending on the meatiness and length of the rack. The ribs are so simple to make (it’s basically set it and forget it). I like to lightly coat the rack of ribs with salt and pepper and then cook them on top a mixture of apple cider vinegar and water. The sweet and tart apple flavour from the vinegar is pleasantly infused into the pork and it comes out of the Instant Pot wonderfully cooked and deliciously tender. You can literally pull the meat apart from the bone and slicing into individual ribs is incredibly easily. The sweet, spicy, and smoky cherry chipotle sauce is so addicting and perfect to brush onto these ribs. 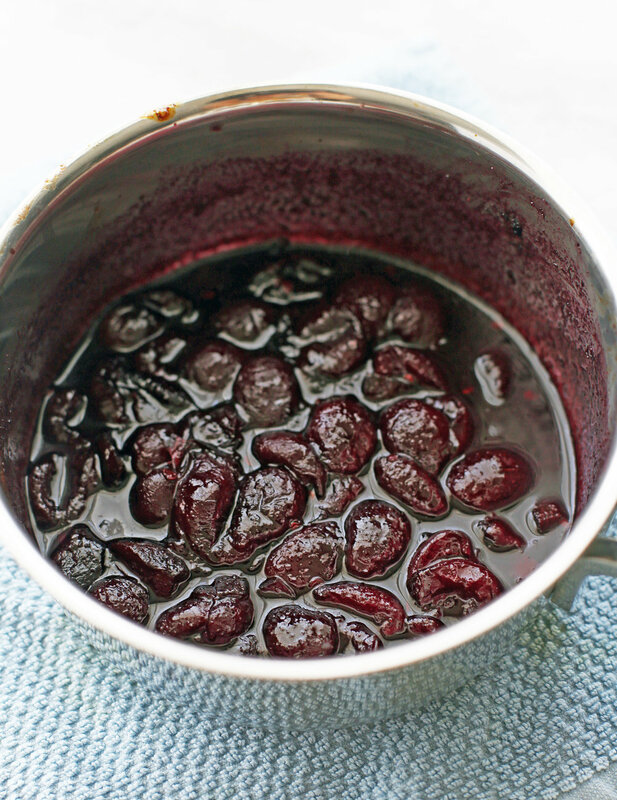 A simple combination of sweet and tart cherries (fresh or frozen – no need to thaw) and spicy chipotle peppers in adobo sauce along with brown sugar, apple cider vinegar, garlic powder, and salt and pepper is all you need. It’s also a one-pot sauce where you simply stir and simmer until reduced and the ingredients are well-incorporated. Then you blend it (use either a handheld immersion blender or a regular blender) until you get a delicious sauce. This sauce would be perfect to use a chicken wing sauce as well. Check out my link to make Instant Pot Chicken Wings if you like. In that recipe, I pair chicken wings with a delightfully salty and sweet teriyaki sauce. How to you make this Baby Back Rib recipe? Fill the bottom of the pot with a mixture of apple cider vinegar and water. Place the metal trivet in the pot and wrap the back back ribs on top of the trivet. Full ingredients and amounts in the recipe card below. Seal the Instant Pot and cook at high pressure for 25-30 minutes, then natural release for 15 minutes before applying a quick release. Wonderfully tender and fully cooked! Just another picture of the cooked rack of pork ribs. Lay the ribs flat on a large baking sheet lined with aluminum foil. I find it easy to pull it out of the pot using the handles of the trivet. Use oven mitts or thick kitchen towels as the metal handles are hot. As the ribs cook, make the cherry chipotle sauce. Add all the sauce ingredients into a sauce, bring to a boil and simmer, stirring until the ingredients are incorporated and reduced in quantity. Then blend the ingredients until smooth. The sauce will thicken slightly as it cools down. Coat both sides of the rack of ribs with a good amount of sauce and optionally broil for five minutes. Then slice up and serve! This recipe requires an Instant Pot at that holds at least six quarts (that’s what I own), mainly due to the thickness (how meaty it is) and size of a full rack of ribs. Water/liquid amount on the bottom of the pot is important. Use the amount listed in the instructions (2 cups) as it is critical to making sure the ribs are cooked and tender. Less water will result in a chewier texture. Times are important. I used pork rib racks that have a thicker cut, so I set the times for 30 minutes high pressure and 15 minutes natural release for tender, fall-off-the-bone style ribs. Decrease or increase the high-pressure cooking time by five minutes according to thickness of cut. Use the trivet (with the handles facing up) to hold the racks of ribs. It’s okay if the ribs touch the side of the pot. Make the sauce while the ribs are cooking. That way, the sauce is ready to be generously spread onto both sides of the rib racks. Save extra sauce to use as dip! Finish the ribs by broiling in the oven. 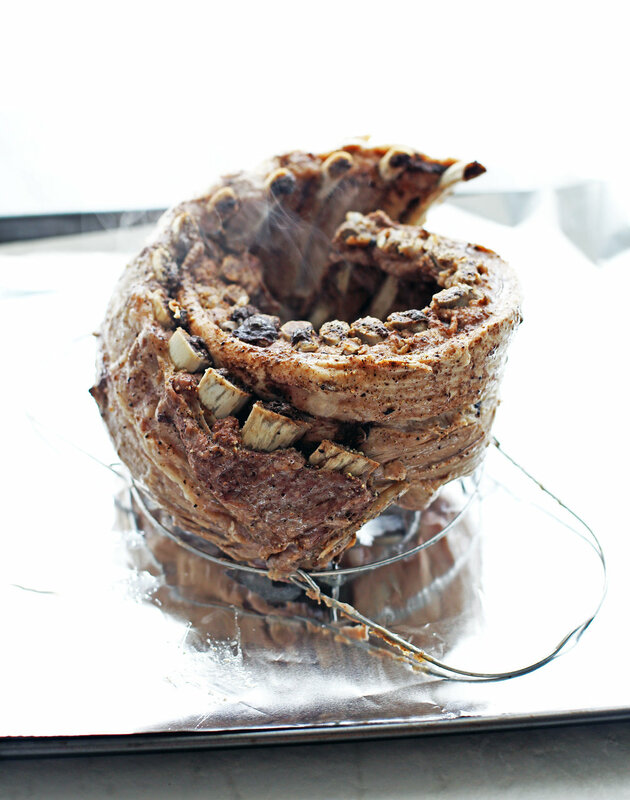 This step is optional, but it imparts a delectable caramelized crispy top. Delicious and flavourful: Tender fall-of-the-bone ribs slathered with scrumptious homemade sauce. Make sure you have plenty of napkins on hand! Quick and easy to prepare: Most of the time is spent waiting for the ribs to cook, but probably a lot less time than making it on the barbeque or in the oven as these ribs are usually prepared low and slow. Perfect to serve the whole family, a get-together, or to bring to a potluck as it makes two whole racks of ribs at once, but make sure they can handle heat! For the ribs. Pour water and apple cider vinegar into the Instant Pot. Then place the metal trivet into the pot. Prepare the ribs by seasoning both sides with a light amount of salt and pepper, pressing the seasoning into the meat. Wrap each rack of ribs on top of the trivet so it fits sideways in the Instant Pot (see photo for example). Seal the Instant Pot and cook at high pressure (“manual”/"pressure cook" function) for 25-30 minutes **(see second note). After it is ready, allow natural pressure release for 15 minutes before applying a quick pressure release to completely depressurize (until floating valve drops). For the cherry chipotle sauce. While the ribs cooks, place a medium saucepan on the stove and fill it with the sauce ingredients. Stir with a wooden spoon to combine. Bring the mixture to a boil before reducing it to a simmer, stirring occasionally, until the mixture is reduced to a third of its original amount. Remove from heat ***(see third note). Using an immersion blender or high-powered blender, blend until the sauce is smooth. Set aside. Put it together. Once the Instant Pot is depressurized, open the pot, carefully remove the ribs from the pot and place them flat on a large baking sheet lined with aluminum foil. Generously brush the sauce on both sides of the rib racks (reserve the remaining sauce). Optional (but recommended) step. Arrange the oven rack so that it is on the top (or near the top) shelf and then set the oven to a high broil. Place the ribs in the oven and let it broil for 5 minutes, until the tops are slightly caramelized and crispy. Remove from the oven and brush with additional sauce if desired. Slice into rib segments. Serve with remaining sauce as a dip if you like. Best served immediately. *I used La Costeña brand. The quantity used in this recipe gives the sauce a medium heat. Feel free to adjust to your preferences. **I used a fairly thick (meaty) cut so I put it in for 30 minutes at high pressure. Decrease or increase the high-pressure cooking time by five minutes according to thickness of cut. Keep natural release time the same. ***Leftover cherry chipotle sauce can be used for up to one week. Let the sauce cool completely before placing it in an airtight container and storing it in the refrigerator.